Professor Janusz Łuksza, the winner of the Prof. Marian Schneider Memorial prize in 2009. The 3rd International Conference on Drawing Technology, Zakopane, March 5-8, 2009. I am really honoured and proud to have the opportunity in introducing the candidate for the Professor Marian Schneider Memorial Prize – Assistant Professor Janusz Łuksza. 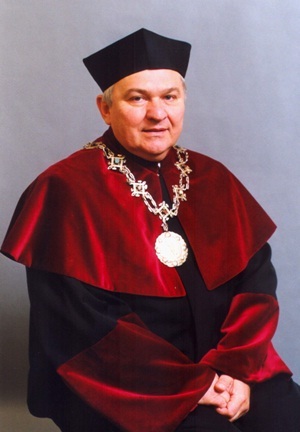 Professor Janusza Łuksza was born on November 17, 1945 in Tomaszów Mazowiecki. In 1963 he graduated from high school and the same year began his studies in the Faculty of Metallurgy at the AGH University of Science and Technology in Cracow. In the year 1969 after defending his master thesis and examination he graduated with a master’s degree in engineering (specialisation “plastic metal working”). Started his carrier also at the AGH University of Science and Technology in 1969 in Cracow, working as: assistant, senior assistant, lecturer, senior lecturer, associate professor, full professor. He was also employed at the Technical University of Czestochowa as an associate professor during the years 1994-1996 (as a second job). – chairman of the Faculty’s Committee for Doctoral program studies in Metallurgy (special field: plastic processing – from 2006 onwards). And what’s more, the candidate is a fellow of the AGH Senate from 1996, and since 2005 has held the post of chairman of the Senate Commission for the Budget. Professor J. Łuksza has been chairman of the Jury in the Prof. Radziejewicz-Bielewicz competition since 2002. Professor Janusz Łuksza is an extraordinary diligent person; his lectures are carefully prepared as far as the contents and logical layout go. Presently he conducts lectures on the following subjects: „Theory of elasticity and plasticity”, „Mechanics of continuous media”, „Plastic working processes”, „Mechanics of solids”. The candidate is the author and co-author of over 70 publications in Polish and foreign magazines and over 30 papers published in materials for Polish and foreign conferences. Moreover the candidate is the author of a book „Drawing elements” published at the AGH in 2001 and co-author of a book „Steel and special alloy wire – production, processing and application” published by WNT in Warsaw 2006. He is also co-author of 3 text books: „Basics of roll pass design”, issued by AGH, Cracow in 1970, “Selected aspects of drawing engineering“ issued by AGH, Cracow in 1983, “Selected aspects of drawing engineering“ second Supplement Edition, issued by AGH Cracow 1986. He promoted 3 doctors and over 60 masters of Science and engineers; presently he is the tutor of a doctorate thesis on the influence of ultrasonic vibration energy on the process of drawing through the split drawing die. Assistant Professor Janusz Łuksza made 7 reviews of doctorate theses, 6 reviews of postdoctoral degree theses and 4 opinions for professor nomination procedures. The candidate particularly contributed and put into realization of over 100 scientific & research works and expertises including 12 KBN grants and 2 scientific projects within the PHARE program. Special attention should be paid to Professor’s Łuksza work as director of 5 KBN implementation projects during the past years, implemented in such plants as Baildon Steel Mill (thin wires of high-alloy and special steels), the Screw Factory ŚRUBEX S.A. (selection of materials for fasteners), Mikrohuta (rolling strips and drawing wire of acid-resistant steels), Huta Cedlera S.A. (the Cedler Steel Mill) (heat treatment and mechanical working of wire rod of micro-alloyed steel). Presently, he participates in a research and development project of the Ministry of Science and Higher Education concerning steels intended for operation in various aggressive environments. Professor J. Łuksza’s industrial experience in economy, organization and management of the Polish steel industry and great scientific achievement essentially contributed to employing him as scientific consultant in several steel mills, such as: Bankowa, Warsaw, Baildon (during the year 1976/2002) and as a scientific advisor in the Tadeusz Sędzimir Steel Mill (1995-2001). Professor Janusz Łuksza is also a fellow of the Academic and Economic Steel Association Council and in 2003 was elected the Council Chairman. He is also a member of the Metallurgical Board of the Trade and Industrial Chamber in Katowice (from 1999 onwards) and was a member of the Supervisory Board in the Tadeusz Sędzimir Steel Mill in 2002. Professor J. Łuksza is the reviewer of 10 books and monographs on subjects connected with theory and practice of manufacturing wire and steel strips. In my opinion, the activity of Professor J. Łuksza is versatile both in inspiring and organising scientific research, as well as educating young scientific staff. The candidate has great achievements in the field of plastic working. He has created a scientific school that enjoys recognition both home and abroad. So I think that awarding professor Janusz Łuksza – the eminent scientist and noble person – with the Professor Marian Schneider Memorial prize is fully well-deserved.